PS Internet Company Review 2019: Is PS Internet Company a Good Hosting? 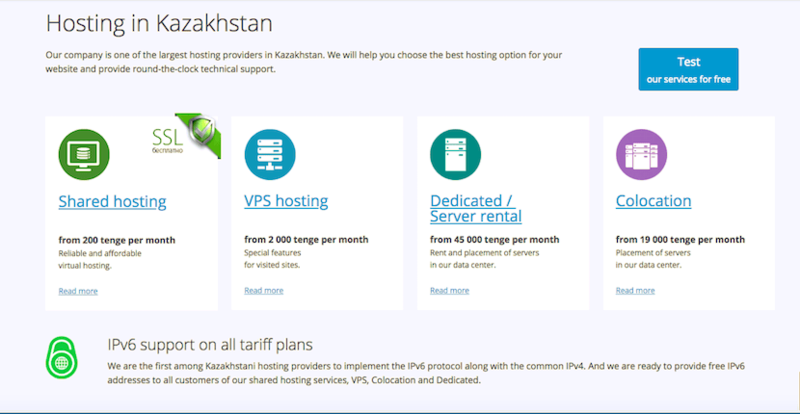 PS Internet Company is a large website hosting provider with their own data centers located in Kazakhstan. They offer a good selection of very affordable services backed by good customer service. PS Internet Company was founded in 2003. They are now one of the leading website providers in Kazakhstan, with more than 100,000 customers and 66,000 registered domains. They own their own data centers, have built their own website builder, and have acquired other companies in the industry. A drop-down selector is provided to change their website into more than 100 different languages, but this seems simply to trigger a Google translation of the content. They also offer their own ISPmanager control panel as well as Plesk. PS Internet Company owns and operates its own data centers, which means a faster response time to website issues and faster website load speeds. Their network includes 14 telecommunication providers, carrier-class network equipment, and a power supply with N + 1 redundancy. They have 24/7 technical support and infrastructure monitoring. Since I was surprised to find no uptime average or guarantee on their website, I contacted support to try to get an answer. I succeeded in securing a vague assurance that they “try to maintain maximum uptime, but sometimes there may be short-term server malfunctions that we aim to identify as quickly as possible.” Well, it’s not the same as a concrete 99.9% uptime guarantee backed by SLA, is it? Their home-grown website builder is a big boon for beginners. Although it costs extra, it comes with website templates, backups, email boxes, and technical support. They allow customers to try this before they buy it, which is great for new website owners. PS Internet Company’s prices are very affordable. Even their most basic package allows you to host more than one website, but it does limit you to 100 MB disk space. SSL certificates and backups are included in the price, but domain registration costs extra. I like the fact that they offer a variety of contract lengths from monthly to triannually, with deep discounts for purchasing longer terms. If you’re still not sure, you can find assurance in their 7-day free trial and 14-day money-back guarantee. Given their apparent size, I was slightly surprised by their limited support options. They have location-specific telephone numbers, plus email and ticket support, but no live chat. There is no knowledge base for self-service support, but they do have a small set of FAQs. On the plus side, I have received quick and helpful responses – in excellent English – whenever I have contacted them by email. Since 2003, PS Internet Company has grown from strength to strength. They’ve acquired other large website hosting companies, opened their own data center, built their own website builder, and introduced IPv6 technology. Wondering how PS Internet Company stacks up against other Web Hosting companies? Enter any other Web Hosting company and we will give you a side-by-side comparison.